When a couple wants a marriage to end, they often choose divorce to move on. Divorce is a complicated and overwhelming process. Some of the many divorce issues one can face include distribution of assets, spousal maintenance, child support, and child custody. Divorce can be further complicated by individuals who are military members and those who are considered high net worth. Some couples wish to avoid divorce but end the relationship through legal separation. If you are facing a divorce case or need a legal separation, contact an attorney that can protect your interests. The Law Offices of Mark S. Paige, P.C. is an experienced law firm serving the Hudson Valley with effective and compassionate legal services for those faced with divorce and separation matters. If you need a law firm on your side, contact our firm for a consultation. Some married couples cannot reconcile their differences and need to end their relationship with a divorce. Divorce is a common occurrence and, depending on the circumstances, can be a lengthy and complex ordeal. 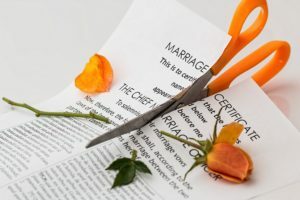 Whether a couple can end their relationship through alternative dispute resolution or through a court case, divorce is an emotional and trying process. Divorce can be a trying time in one’s life. When issues are unresolved and emotions run high, a divorcing couple can easily find themselves in court. When a couple can agree on matrimonial matters, they may be able to complete the divorce and move on rather quickly through alternative dispute resolution. Unfortunately, this is not always the case. Property distribution can be one of the most disputed issues in a divorce. Understandably, both parties have emotional ties to their possessions, especially the home. The thought of splitting assets can be overwhelming for some. When emotions run high, both parties feel entitled to certain assets and often disagree on how possessions should be split. In New York State, alimony is known as spousal maintenance. Spousal maintenance can be a hotly contested matter in a divorce. Generally, spousal maintenance is the obligation of one party to support the other after the end of a marriage. When a family has a business, divorce can be quite complicated. No one wants the divorce to impact the business but per New York’s rules on equitable distribution of assets, if the business is considered marital property, it must be addressed in the divorce unless agreed to outside of court. When a family law matter concludes, the court will issue an order to be followed by all involved in the case. When a party doesn’t follow a court order, there are consequences. Courts will issue orders for matters including alimony, child support, child custody, child visitation, property distribution, and even relocation. If a party willfully disregards a court order, there may be a need for action. Divorce can be an overwhelming ordeal for many. Each party wants to move on to something better and resolving contested issues quickly is often in everyone’s best interests. When a marriage ends with parties that have accumulated substantial assets, possessions, money, and debts, the matter becomes far more complex. Often, people who need to end a marriage will choose divorce. Depending on the situation, they will often decide between a court case or alternative dispute resolution to resolve the matter. In some cases, a couple will decide to avoid divorce and pursue a legal separation. Divorce can be complex. When a member of the military is faced with divorce, it becomes even more complicated. Military members must address the same applicable issues as civilians engaged in divorce. After a divorce or family law matter, a judge will issue an order that both parties must follow. Whether it is related to property distribution, child support, alimony, child custody or child visitation, a judge’s order is law. Taking these facts into consideration, a judge’s order is not totally set in stone. Courts regularly hear requests for modification to an order. When a couple’s relationship takes the important step towards marriage, protecting one’s assets and appreciating property is often not even a thought. The future is uncertain and protecting one’s important possessions is something to consider, especially for high net worth individuals.